Biggest Oil Spill in History? Such recovery operations have never been done before in the extreme deep-sea environment around the wellhead, noted Matthew Simmons, retired chair of the energy-industry investment banking firm Simmons & Company International….Slant drilling — a technique used to relieve pressure near the leak — is difficult at these depths, because the relief well has to tap into the original pipe, a tiny target at about 7 inches (18 centimeters) wide, Simmons noted. 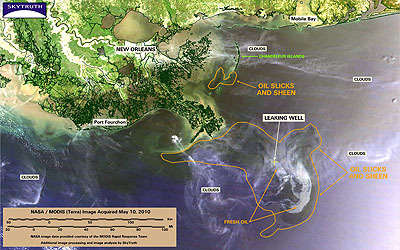 “We don’t have any idea how to stop this,” Simmons said of the Gulf leak….If the oil can’t be stopped, the underground reservoir may continue bleeding until it’s dry, Simmons suggested. BP’s chief executive, Tony Hayward, has estimated that the reservoir tapped by the out-of-control well holds at least 50 million barrels of oil. Even if the well is capped, this is going to be a huge spill. The spill rate, originally estimated at 50,000 gallons a day and then 210,000 gallons a day, might actually be as much as a million gallons a day — or maybe even more. But it’s hard to tell because BP is using chemical dispersants to send most of the oil to the bottom of the sea. This keeps it off the shore, but might end up doing more damage in the long run. Nobody seems to know for sure.